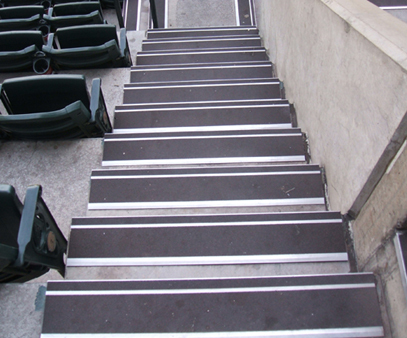 Wooster Products Inc has continually made quality anti-slip stair treads and walkway products right here in the USA since 1921. 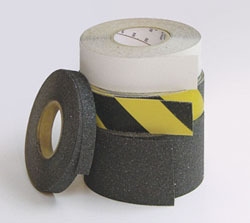 Our full line includes cast iron, cast aluminum, extruded aluminum, pressure sensitive adhesive tape and coatings. Also see our line of photoluminescent (glow-in-the-dark) nosings and treads. We have products for new construction, renovation, even OEM applications. Heat-treated, corrosion resistant, extruded aluminum base with satin/lacquered finish. The use of diamond-hard aluminum oxide in the filler assures long tread life under heavy pedestrian traffic. Designed for inside or outside use. High content of aluminum oxide abrasive grit for long life and lasting beauty. Spectra’s® safety surface has easy maintenance features and insures excellent protection from liability of falls and injuries. Heat-treated, corrosion resistant, extruded aluminum base with satin/lacquered finish. 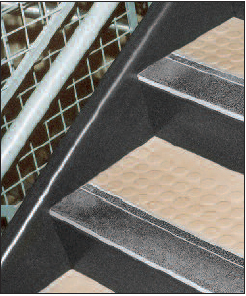 The use of diamond-hard aluminum oxide in the filler assures long tread life under heavy pedestrian traffic. Designed for inside or outside use. 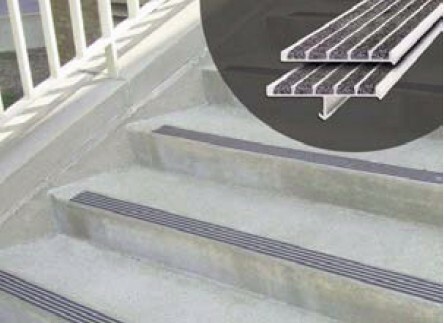 They are designed for the modernization and restoration of all types of stairs, while also providing excellent anti-slip protection. 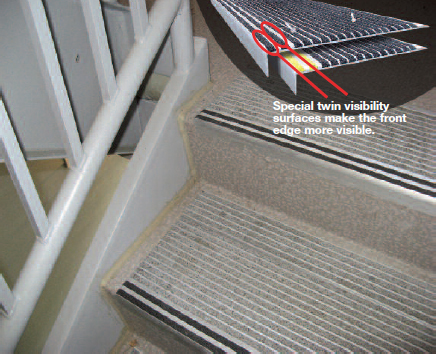 Beautify and protect worn or slippery stairs. Also available with NiteGlow glow-in-the-dark anti-slip surface. Quick and easy to apply. 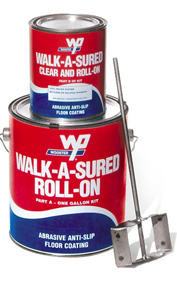 Installs in seconds on any dry, clean, smooth surface. Just remove the protective liner from the underside to expose the special pressure-sensitive adhesive, then apply in the proper position and roll or press in place. Each piece has a heavy coating of pressure-sensitive adhesive especially formulated for a superior bond to practically any clean, dry, smooth surface. Coatings contain aluminum oxide or zirconium grit which give the coatings long-lasting added traction.